rec. Großer Saal der Hochschule für Musik und Darstellende Kunst, Frankfurt/Main, Germany, 2014. This is a fascinating disc that presents us with five highly original works from five composers who, at the time of writing, were developing their art. Each of these pieces is an indicator of what was to come, apart from those by Lili Boulanger whose tragic death aged only 24 from Crohn’s disease robbed the world of a prodigious musical talent. As a Shostakovich ‘nut’ I was delighted to hear his Piano Trio No.1 since I had never heard it before. Don’t ask me how it could have slipped past my radar because I am at a loss to know the answer when I own all the symphonies, concertos, string quartets, piano sonatas, operas and film music. There have been plenty of recordings of it as I now discover. It was no surprise to read that the trio was originally entitled Poème and that it was inspired and dedicated to Tatyana Glivenko, a first love. It contains the sweetest of tunes which is full of longing. As such it is steeped in a romanticism which Shostakovich would later repudiate although such writing would recur at times in other of his compositions. It is an extremely mature sounding work to have been composed at the age of 17. Trio Élégiaque on the other hand is by Rachmaninov who was unashamedly romantic and isn’t that what we all love about his music? This was composed just after he had completed his piano studies with distinction aged 18 and is what we expect from this quintessentially soulful composer. The booklet notes speak of there being “a grain of truth” in what is described as the cliché concerning ‘Russian soul’; I would say that there is more a grain silo full of truth in that concept. It is evident in too many works by Russian composers for it to be coincidental. Mahler’s Piano Quartet was composed between the ages of 16 and 18 and is another pointer towards the great music that was to come from his pen. Again dripping with romanticism it is full of the pain of adolescence and uncertainty about how the future will evolve. Reading that Lili Boulanger was aware of how little time she had makes her music all the more poignant and no doubt increased her resolve to leave her musical thoughts in as many compositions as time would allow. The first of these short trio movements is achingly sad while the second is a complete contrast and the booklet notes write of them as though they were written in the reverse order to how they are played here. Given that Lili Boulanger died so soon after their composition it would seem more appropriate to play them so that the saddest movement comes last. Everything I have ever heard by her I have found totally satisfying and these two pieces are certainly no exception. John Ireland is still far less well known than he deserves to be even though this piano trio won him second prize in a competition that had 67 works submitted to it. It was no less a composer than Frank Bridge who pipped him to the post; he won first prize in the same competition the following year when 133 works were put forward. This Phantasie Trio in A minor shows a young composer who has already learned a lot from the musical traditions of Germany and Europe in general. This is something that would be honed and perfected down the years largely unaltered; Ireland was not seduced by twelve tone trends or other avant-garde experimentation. This trio points the way his music was to take — always full of rich harmonies and lovely tunes. 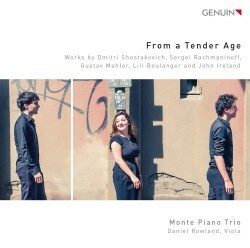 The Monte Piano Trio brings freshness to these works and Daniel Rowland is a fine addition for the Mahler quartet and the disc is warmly welcomed.